Due to unprecedented demand we are now in a short supply of properties to sell but an abundance of buyers are waiting to find their new home. 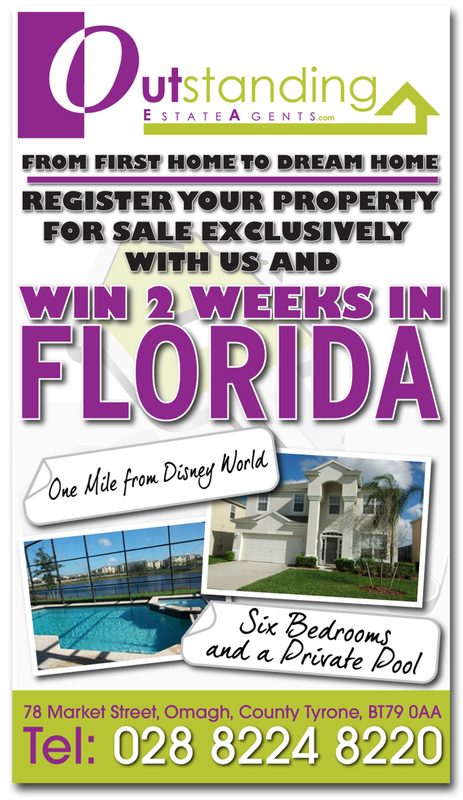 As a result we are going to offer an exclusive promotion where we will list and register your property with PropertyPal for free and also offer a fortnight holiday in Florida in a five star gated community house located just one mile from Disneyworld. We will enter you into a competition that will be drawn on 31st October 2014 for a chance to win two weeks stay in Plutos Palace which is a six bedroomed home with private pool with lakeside views. Situated approx. 1 mile from Disney. We will pay for two weeks stay normally priced at up to £3000. You can book your own dates. All you have to do is enjoy!!! 6 bedrooms - Lakefront luxury!! 1 mile to Disney World and located in the gated Windsor Hills Resort. Lakefront Orlando vacation home next to Disney with 6 bedrooms & 4 bathrooms. More privacy with no rear neighbors! This is the largest model home in the Windsor Hills Resort. The Owner's Master suite has a King bed and a huge bathroom with a walk in shower, private toilet, separate garden tub, two sinks and tile flooring. The Owner's Master Suite #2 has another King bed and a walk in shower in its bathroom. Bedroom 3 has a Queen Size bed with a jungle theme. Bedroom 4 has a flowered theme for girls & bedroom 5 has a sports theme for boys. Bedroom 2 will have another Queen Size bed. Each bedroom for this luxury Orlando vacation home rental next to Disney World has a TV!! The modern family room has leather sofas and a 55" flat screen TV, great for hanging out long after the parks have closed. The living room has a modern look also and it great to sit and talk about the fantastic vacation you are having. There is free high speed internet with wireless capability if you'd like to bring your computer to map out the area destinations from this luxury vacation rental home in Orlando, Florida. There is tile flooring throughout the common areas which is great for guests with allergies! The spacious kitchen is great to cook and dine at the home. Rent a grill for the perfect outdoor BBQ. This home features a game room with a pool table, air hockey, big screen TV, PS2, sofa & chairs. The Windsor Hills Resort clubhouse is approximately 300 yards away and the large playground area is approximately a 50 yard walk!! The spacious pool & heated spa have a gorgeous view of the community's lake and interesting local wildlife. It has a covered lanai with table & chairs to escape the warm Orlando, Florida sun and loungers for the sunbathers. This luxury vacation rental home next to Disney has plenty of space to spread out and enjoy! Click on the community link above just under the property photos for pictures & full community amenities that are included in your stay! All bed linens, bath towels & pool towels are provided for our luxury Orlando, Florida vacation home rental properties. All of our luxurious Orlando vacation home rentals have a full size washer and dryer, iron and ironing board, central air & heat, pack n play portable crib & highchair, hair dryers in each bathroom & telephone service. Our private pool homes will feature child safety alarms on all doors leading to the pool area! All of our luxury Orlando, Florida vacation rental homes near Disney World also include a fully equipped kitchen with all dishes, glasses, appliances, pots & pans, coffee maker, microwave, cookware, utensils, etc. Windsor Hills Resort is the Closest Residential Community to Disney World Property. Windsor Hills Resort is 24 hour guard gated and is the very best of its kind for luxury Orlando, Florida vacation homes next to Disney World. There are several golf courses within a few miles. There are many shopping plazas close to the Orlando vacation homes with restaurants such as House of Blues, Kobe Steakhouse, Charley's Steakhouse, Joe's Crab Shack, Bahama Breeze, Sweet Tomatoes, Chuey's Mexican, Bonefish Grill, Wolfgang Puck's, Paradiso 37, Rainforest CafÃ©, Outback Steak House, Denny's, TGI Fridays, Menchie's frozen yogurt, Longhorn's Steakhouse, Miller's Ale House, Applebee's, Flipper's Pizza, Chili's, Macaroni Grill, Pizza Hut, Panera Bread, Cracker Barrel, Golden Coral, Red Lobster, Olive Garden, IHOP Restaurant, Subway & of course all the Disney World dining options in Orlando, Florida. There is a Starbuck's & a Dunkin Doughnuts for morning coffee on the go! Two Mini Golf courses, a brand new flea market and shopping are also near the luxury Disney vacation homes. Located near the Orlando vacation home rentals are liquor stores and grocery stores such as Target, Wal-Mart & Publix. There is also an urgent care clinic, a hospital and drug stores all within 5-10 minutes. Disney World parks (Hollywood Studios, Magic Kingdom, Epcot, Animal Kingdom, Blizzard Beach, Disney Quest, Typhoon Lagoon, etc. ); Downtown Disney, Cirque du Soleil Orlando & AMC movie theatres are approximately a 5-15 minute drive away from the Orlando vacation home area. Old Town Kissimmee (features 75 shops, 8 restaurants & 18 amusement rides) is approximately 10 minutes away. Universal Studios/Islands of Adventure/City Walk/Halloween Horror Nights, Sea World/Discovery Cove, International Drive/Wet & Wild Waterpark & the Orange County Convention Center are all about a 15-20 minute drive from the luxurious Disney vacation rental homes. The Mall at Millennia, Premium Outlets & the Florida Mall are approximately 20-25 minutes. Downtown Orlando/Church Street/Amway Center is approximately 30 minutes from the vacation homes. Orlando International Airport is approximately a 25 minute drive from our Orlando vacation home rentals near Disney World. Busch Gardens is about a 45 minute drive from the Orlando, Florida vacation homes next to Disney. Clearwater Beach & the Tampa Aquarium are approximately 1Â½ hours away. Daytona Beach is a about a 60 minute drive from our luxury Orlando rental homes.